Handmade by the Arturo Fuente Family in the Dominican Republic for J.C. Newman Cigar Co., Diamond Crown cigars are recognized around the world as one of the finest super premium cigars ever made. To deliver the richest, yet most consistent full-flavored cigar possible, the Diamond Crown is made with a larger ring, which allows for the blending of 6-7 individual tobacco leaves. 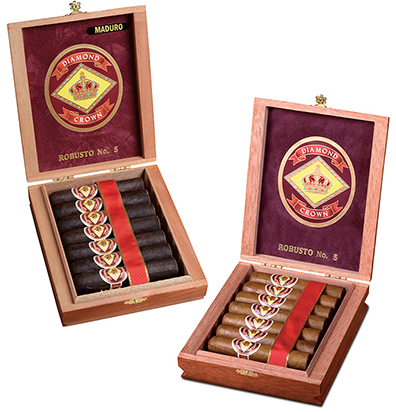 This extremely complex blend of Dominican tobaccos is wrapped in an exclusive Connecticut double-fermented leaf selected from the highest grade of Connecticut Shade leaf in the case of the "Classic" line, and a Connecticut Broadleaf wrapper is used for the "Maduro" line. Both flawlessly constructed Diamond Crown cigars offer tremendously rich, creamy flavors and are considered mild to medium bodied.